When it comes to OS X media playback, QuickTime Player is free, included with every Mac, and optimized to handle Apple’s preferred file types. But if you want to play content that isn’t natively supported by the operating system (such as popular Windows formats AVI and WMV) Apple’s software won’t help without third-party software components installed. The better solution is to skip Cupertino’s media player altogether and download an application built for playing virtually any media you throw at it and can also be upgraded with even more powerful features whenever the need arises. Elmedia Player is available in two flavors: A free version supporting nearly every media format under the sun, along with an entirely optional paid upgrade that adds the ability to download YouTube content, control audio playback settings, or grab still images from video files. I tested the paid version, although they otherwise look and perform the same; with the free version, you’ll see PRO next to locked features. Here’s a short list of what the free version can do that QuickTime Player could only dream of: Open DVD VIDEO_TS folders (complete with menus, although they’re occasionally buggy), natively play FLV, SWF, XAP, DIVX, DAT, and other formats, browse the internet without leaving the application, compile media playlists, and open browser videos via optional bookmarklet. 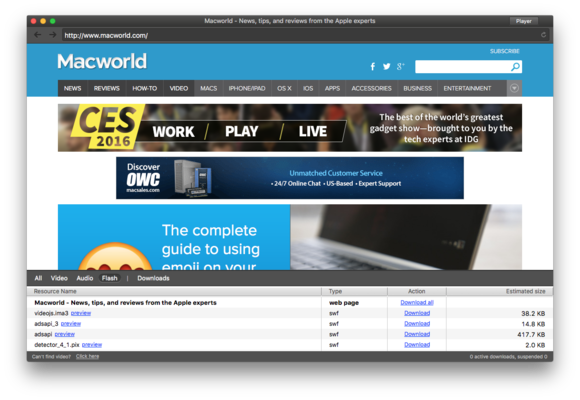 The built-in web browser parses URLs and breaks them down into video, audio, and Flash components. Of course, this only scratches the surface. Elmedia Player includes features Apple abandoned in the transition to QuickTime Player X, such as the ability to adjust brightness, saturation, contrast, sharpness, and noise, change the image layout, or improve audio using custom or built-in presets with a 10-band graphic equalizer. The software supports hardware acceleration for lightning-fast playback of HD videos, and viewers can mirror, flip, rotate, or change aspect ratio without skipping a frame. 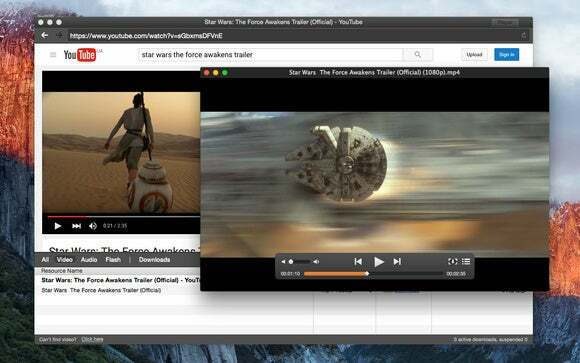 The free, open-source VLC can also perform many of these tricks, but Elmedia Player offers a more refined, polished user interface that puts the focus on media first, without a lot of fiddly settings average users will never use. Elmedia Player provides fast, hardware accelerated playback of videos QuickTime Player can’t natively handle without third-party software. Download All can be used to grab everything on the page, but there’s an option for individual elements, RTMP streams, or the soundtrack portion of music videos in MP3 format from sources like YouTube, Vimeo, Dailymotion, and Facebook. Depending on the video, multiple formats are available and can be selected from the Type column. Elmedia Player Pro users can download video or audio files from popular websites like YouTube. Using the Movie menu or Control-Command-S keyboard shortcut, grabbing a quick still frame from a video is also a snap, which can be saved as TIFF, PNG, or GIF (configured under Preferences > Capture). There’s even an option to record a series of screenshots at intervals from 0.1 to 10 seconds while a video is playing; unfortunately, this can’t be used for creating quick animated GIF files. 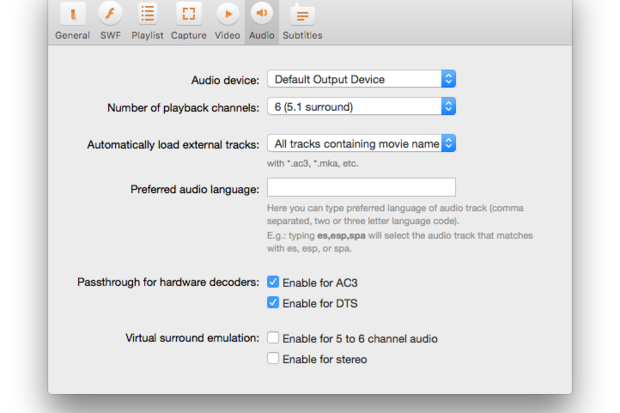 Last but not least, the Pro version includes additional control over audio playback, allowing users to choose the default output and number of playback channels, although 5.1 surround audio played with incorrect channel assignments on my Matrox MXO2 hardware. One thing missing is frame-by-frame control over playback from the keyboard, but there are ample options available for just about everything else. 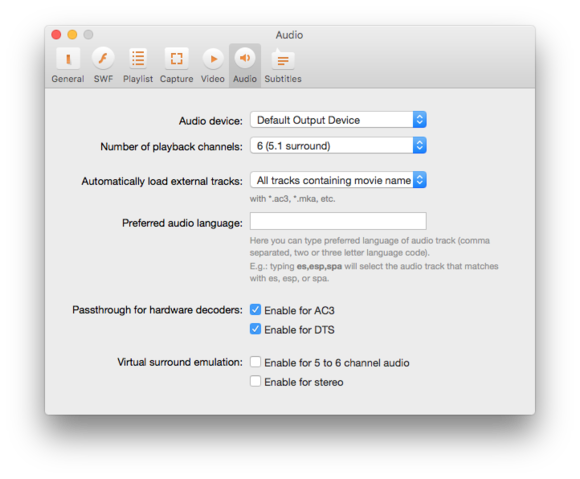 New audio control settings allow for surround playback (including AC-3 and DTS) on supported hardware. 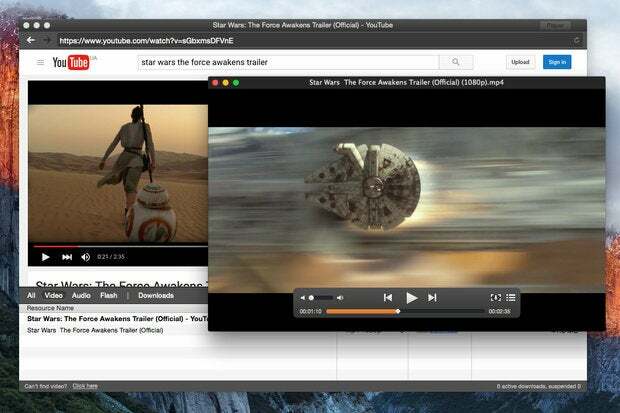 Elmedia Player Pro is an inexpensive, more powerful alternative to QuickTime Player, and if you need it, the ability to download web content is easily worth the paid upgrade.